During November and December of 2014 you can see our most ambitious yarnbomb to date: a 1950 Chevy truck in Old Navy’s San Francisco flagship store on Market & 4th. 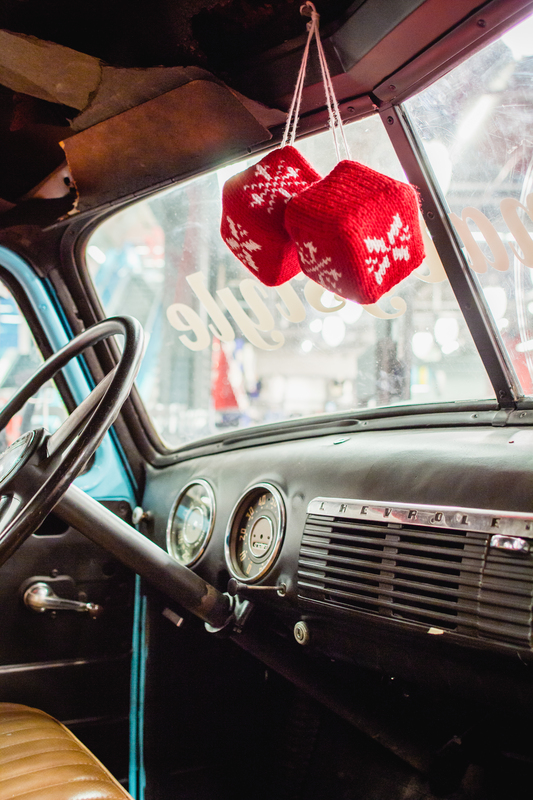 We had such a blast yarnbombing this classic truck in a three-story shopping wonderland. We are so proud of this project, since we pushed the limits of all our skills to make it perfect and amazing, as was the marketing team’s order. We took the Brother KH-270 computerized bulky knitting machine off our wish list for the project and Jill did all the construction while I lounged on my honeymoon, har har. The machine has 114 needles in the bed, so we were limited to panels 36-inches wide, which we hand seamed with the invisible mattress stitch. Elsewhere panels are joined vertically with the invisible kitchener stitch. Hook Velcro tape and a little hot glue hold each panel to the truck at the edges and in the crevices. One of the most difficult parts was breaking down the piece into flat panels. While it seems straightforward enough, it took quite a bit of prototyping and testing to arrive at the correct gauge and adhesive methods. Another difficult part was programming the color work into the machine. While the computerized knitting machine definitely constitutes an upgrade from the Ultimate Sweater Machine that was our previous workhorse, it’s a 1980’s machine with 1980’s technology. You enter the color work chart stitch by stitch on a keypad with directional arrows and an enter button, using a TV as a monitor. No fancy functions like copy and paste or scaling exist. So you can imagine us sitting for hours for entering those gigantic snowflakes, “boop boop booping” along across the 13,000 stitch grid for the large snowflake alone. Not to mention getting Gothic font right! We are also tired! Take a look at these stats to see why: 35 hours on design, 45 hours on construction, and 60 hours on installation during 4 graveyard shifts; 250 ft Velcro, 30 skeins of Caron One Pound yarn. But there’s no rest for the weary! Our next stop is another installation at Old Navy’s New York flagship store on 34th Street. It will go up on Nov 20, so stay tuned. You always surprise us with such brilliant projects. Thank you. I want to sit in it to! Unfortunately we realized you can’t open the doors anymore once it’s all sewed up 😛 Thanks for your kind words. Glad you enjoy having fun with us! This looks great, thanks so much guys! You guys are amazing. Hope to see you back at MKGSFBA sometime soon. You really set off our new season with a creative blast! We were just talking about going back! We had such a good time and we could learn a lot from the intricate projects you guys do. Thank you, Ellen. Hope to see you soon too! Love what you guys do with sheep hair! Graffiti with a tactile thing going on! Wish you would come to Ottawa and give us one of your make-overs. Keep up the lovely work and fab shares! Was soo excited at the thought that my NYC trip coincided with your installation there but alas, was told only the SF store had the truck!! What happened?? Theresa, we did a separate install in the NY flagship store on 34th. It was a trio of bumper cars. It’s up now!